The newly-accelerated speed of play in NCAA Men’s College Basketball may have had some side effects other than a simple increase in tempo and higher scores. The faster pace may make teams change the way the play the game itself. One place we might see such a change is in three-point shooting. Teams often resort to hoisting a “desperation three” if their half-court offense has bogged down and the horn on the shot clock is about to sound. With the shorter clock, teams have been averaging a smidgen over twenty three-point attempts per game this season, about one and a half more than in 2014-2015. 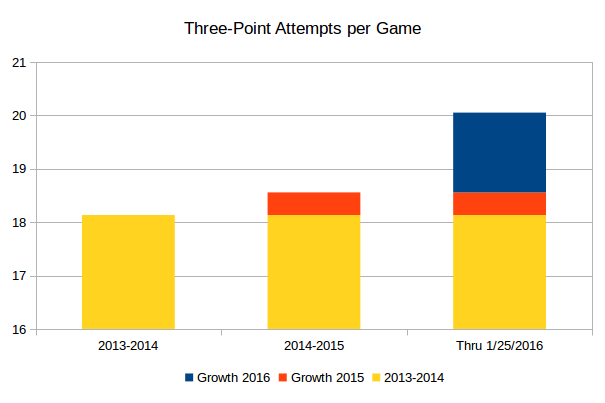 Three-point attempts grew between 2015 and 2014 as well, but the rise in 2016 is some 3.5 times greater than the increase between 2015 and 2014. Even if we deduct the 0.42 growth in attempts between 2014 and 2015 from this year’s total, that still leaves an additional 1.5 three-point attempts per game since the clock was shortened. “Desperation” three-point shots probably account for a lot of this growth. All these extra three-point shots have not affected accuracy. Teams shot 34.3 percent from outside the arc in 2014-15 and are shooting a statistically identical 34.6 percent now. More striking is the sharp decline from the rate of 36.1 percent in 2013-2014. 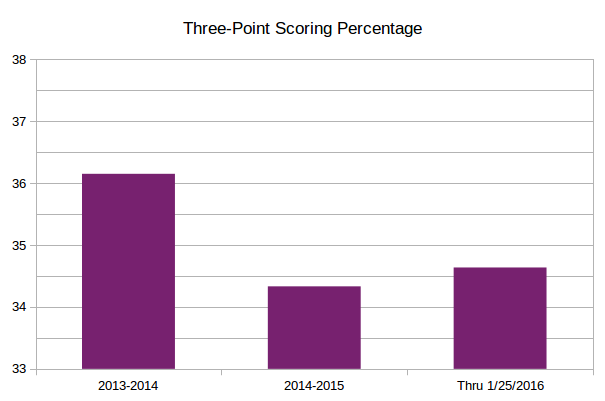 While three-point accuracy rebounded slightly this season, it still remains statistically below 2013-2014. Most basketball teams play with a “shot clock” that limits the amount of time that either team can spend holding the ball. In professional men’s basketball the clock runs for 24 seconds. Both professional and collegiate women use a 30-second clock. Until this season collegiate men had the luxury of a 35-second clock, considerably longer than that used in the professional ranks to which many of these players aspire. Now the men have joined their female peers and play on a 30-second clock. Has the faster pace of play affected scoring and, if so, how? These figures come from games played during two equivalent weekends in 2016 and 2015. Most teams were playing conference opponents so the level of competition is roughly the same. This year’s large snowfall in the Mid-Atlantic states produced a few cancellations so the number of games is slightly smaller for 2016. The margin of victory also grew by 1.5 points, but that difference doesn’t pass statistical muster. There is no statistical evidence that the faster clock has increased the margin of victory. Reducing the clock from 35 to 30 seconds constitutes a 14 percent reduction (5/35) in time of possession. Scoring, on the other hand, has increased by only 8.6 percent in response (11.5/133.8). The shorter shot clock has increased the pace of play as well. Using the enormous archives of collegiate basketball statistics available to subscribers at Ken Pomeroy’s kenpom.com, I averaged his measures of “tempo” and “efficiency” for the 351 Division I teams in his database. These figures are based on his estimates of the number of possessions per game using a formula explained here. I compared the entire season figure for 2015 with those for games played through Sunday, January 24th of 2016. “Tempo,” the number of possessions per forty-minute game, has increased drastically since 2015, rising well over four per game. That alone might account for the increase in scoring, but it is not the only factor. Teams are also scoring about one point more per hundred possessions this year than last. So not only do teams have more possessions with a shorter clock, the faster pace appears to make those possessions slightly more productive as well. Obviously this change will wreak havoc on historical comparisons to the 35-second era. Identically-skilled players in 2016 should be scoring on average about nine percent more compared to the men who played in years past.